The Arts for the Parks competition was a 20 year long show created by the National Park Academy of the Arts and private supporters to benefit the National Park Conservation Alliance. The program was designed to celebrate representational artists, to enhance public awareness of the National Parks and to contribute to programs benefiting the National Park System. 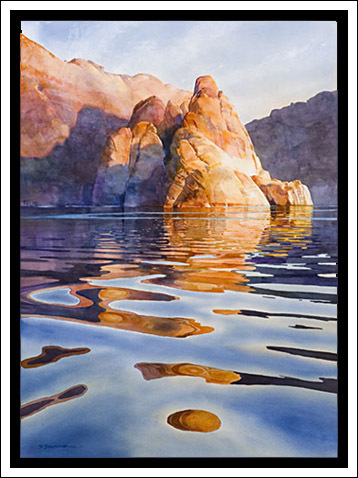 Each year, the artwork selected for the Top 100 show was part of the Arts for the Parks Top 100 National Tour, where the artists shared their visions of our national parks with tens of thousands of people around America. The touring exhibition of Top 100 Arts for the Parks images, organized by the National Park Academy of the Arts, was enormously popular with audiences. The show closed after 20 years, in 2006. David’s Top 100 paintings are all in private or public collections, however Giclee prints are available for most of them. Right: “Morning Near Hole In the Rock: 2005 Founders Favorite Award & Bronze Medal winner.